Although expected to pick up the battle to reclaim the lead of the championship, Lewis Hamilton did not look strong in Sochi, his star rather dimmed by his more prominent team-mate Valtteri Bottas, who seemed to be extracting more speed out of the Mercedes challenger that weekend. But – to the surprise and awe of the F1 world – this was not panning out to be a Silver Arrows’ show. On the Saturday, the reigning champion team lost the qualifying to Ferrari – not just the pole position, but the complete front row, confirming their closest rivals are truly a force to be reckoned with (in case their lead in the standings wasn’t enough proof of that). This was not only the first time Mercedes was going to start from the second row or lower since the Singapore GP 2015 (when actually Hamilton and Rosberg started 5. and 6. respectively); more importantly for the most prominent name in Formula 1, it was Ferrari’s first front-row lockout since France in 2008. Kimi Raikkonen finally came out of hiding in Russia, clocking some impressive times on Saturday; but in the end it was his team-mate Sebastian Vettel who claimed the pole – a perfect spot in a one-stop, pace-focused race. 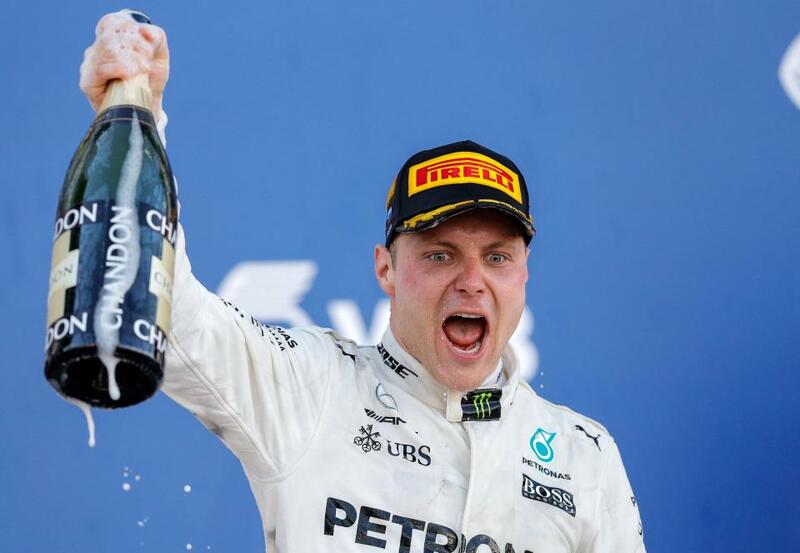 And yet, the prospect of extending the German’s title fight lead further over Hamilton – who became a second-plan player after clocking only the 4. fastest time in qualifying – encountered a spanner in the works, and its name was Bottas. The Finn, who started the race just behind Vettel on the grid – in third, made an impeccable launch off the line on the lights out, to overtake both Ferraris in one smooth swoop. Hamilton seemed to have progressed a place too on the first corner, but backed out on the next giving the spot back to the other Finn in front, Raikkonen. Brakes were put on any further action when a safety car was called out almost immediately after, as Renault’s Jolyon Palmer and Haas’ Romain Grosjean collided at Turn 2, putting an end to both of theirs pretty miserable weekends (neither of them made it out of Q1 on Saturday). A few laps later, the pack was let loose to race again, but by the time Ferrari realised that, Bottas was long gone into the distance – and so the two-Horse chase commenced. As predicted, based on previous years’ experiences, there was little action to be expected on the track, so the pits were anyone’s serious hope for a reshuffle of the grid; Bottas was the first to take the dive, followed shortly by Raikkonen, and then Hamilton. Vettel stayed out for a longer stint, trying to extend his then lead over the pack as much as possible, to try and undercut the Mercedes – but the compound giving way, and then minor delay with his front wheel in the pits rendered those efforts irrelevant, and he emerged in the same spot as before… but with much fresher tires than anyone else in the challenge for victory. The four-time champion was clawing away tenths of seconds off Bottas’ advantage lap by lap; but ultimately, there weren’t enough laps left for him to complete the deed, and he crossed the line second – only 0.6sec adrift of the winner. And what a deserved win that was for the 27 year old Finn… After 81 GP starts, and only four of those with Mercedes, Bottas finally scored his first ever career victory, despite the setback of Bahrain, and a hungry multiple champion as a team-mate. “Amazing,” he said on the podium. “It took quite a while, more than 80 races for me, but definitely worth the wait, worth the learning curve. “I think I have had a little bit of a rough start to the season” the Ice Man said off the podium. “We keep trying and keep improving and I’m sure we’ll get there, but it’s all about… all the small details have to be exactly there and then you will get the first place. Raikkonen has a point there, as with this result Ferrari have lost their constructors’ leader title to Mercedes, even if only by one point. But at least the Finn’s team-mate could still enjoy the bubbly that evening, as – despite coming through second – Vettel still extended his championship lead over Hamilton, who – in an unlikely fashion – disappeared off the scene and only finished the race outside the podium. “For me it was a very tough weekend,” the Brit said after the race. “I just wasn’t quick enough… I think I had the pace to fight with Kimi, but the car just kept overheating. Hamilton was not the only looser of Russia; more painful disappointment came for Daniel Ricciardo, who was hit by a brake issue early in the race, calling it a day. This was the Aussie’s second DNF in four races; what’s maybe worse is that it came just two weeks after his team-mate Max Verstappen literally hit the wall at the Bahrain GP with a similar issue – suggesting Red Bull has some problems to fix before it can find itself in the mix with Mercedes and Ferrari. Still, Verstappen matched the team’s best result in Russia with his 5. place finish – which, however, came 26sec after Hamilton crossed the line. He was followed by the two Force Indias, who continue the team’s impressive streak of double-point finishes – better still, their junior Esteban Ocon progressed from straight 10. place finishes, to 7., to further extend the team’s lead over their constructors’ rivals, Williams. Speaking of whom, Williams got little camera time this weekend, and the spotlight was on for the wrong reasons. Their rookie Lance Stroll was recognised for finally completing a race this season, after a combination of unfortunate events in the previous three GPs – but it was still just outside the points, in 11. While his senior team-mate Felipe Massa got under the skin of Vettel on the final lap, when he got into the way as the German was chasing Bottas using the long-awaited DRS advantage. Out of them all though, the one that could do with no media attention whatsoever was Fernando Alonso; it was on the formation lap that the Spaniard found out about the loss of power to his Honda-powered McLaren – at learning which he parked the car at the entry to the pits and simply walked away, forcing a second formation lap on the field. You’d expect that – with the engine issues continuing, if not worsening – his rookie team-mate Stoffel Vandoorne would have had finished the race last; but in fact, he came ahead of the two Saubers who closed the final grid – and who have been confirmed to be taking on the Honda engine from 2018, as McLaren switch to Mercedes.